Game developers, please stop making zombie games when you stop making good ones. The PlayStation 3-exclusive Dead Nation is allowed. It's a good one. Dead Nation could have been a bad one. It's not just another groaning zombie game, following Left 4 Dead, Dead Rising, Left 4 Dead 2, Dead Rising 2, Avatar Zombie Massage — it's a top-down shooter zombie game, of which we've had plenty: Zombie Apocalypse, I Made A Game With Zombies In It!, Burn Zombie Burn. Dead Nation is therefore the video game equivalent of a new brand of bottled water. But from the start it should earn the benefit of the doubt because it's made by Housemarque, the studio behind the superb Super Stardust HD an arcade spaceship-shoots-asteroids game that managed to be great despite a shambling horde of those. Not so much fans of zombies as fans of score-based arcade games. The presence of zombies in the game is really just a way to tweak the rule-set of the familiar arcade-shooter genre, affecting how the enemies move, what might kill them and so on. People who want to tally high scores and compare them globally would enjoy this. Just make sure you have an HD TV to admire the beautiful — yes beautiful — zombie masses. Housemarque makes very good downloadable games. Really, though? More zombies? It's either cynical or unfortunate that Housemarque put so much effort into a game that comes out at a time when we are splattered with zombie games. 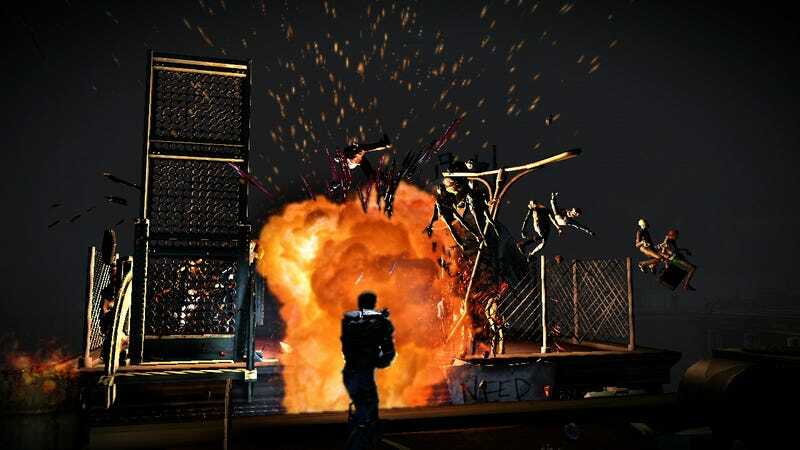 Dead Nation doesn't appear like it would satisfy any unmet craving. But it can, because its gameplay is pure and strong. You view the game's 10 levels from an overhead perspective, directing your armed male or female hero though ruined city streets, graveyards, rooftops, hospitals and more, fending off usually more than a thousand zombies per 20-minute level. You have an arsenal of upgradeable weapons, from machine guns and shot guns to mines and grenades, as well as many pieces of better armor to find in the hidden tributaries of the game's levels. Shooting your way through darkness is a key element of the game, as each turn has the potential to reveal another horde of zombies ready to pounce. A flashlight helps, though the intentional ammo scarcity for your best weapons and the unintentional overly-dark presentation make the fight tricky even on the game's second of four difficulty levels. Really? Top-down shooter? Yes, top-down shooter, and here's why zombies help this game a lot. Housemarque's previous PlayStation 3 downloadable game, Super Stardust HD, featured a spaceship that could skate around spherical playing fields (planets), blasting so many storms of falling rock I worried for the health of my console's processor. The milieu was sci-fi, so the game — the hero ship and the enemy rocks — played fast. Dead Nation provides an interesting twist. The hero can still be fast, running or utilizing a quick dash to evade danger. The enemies, being zombies, are either slow creepers or an open faucet of murderous intent. Either enemy pattern is interesting — and amplified with the devious twist that zombies have a tiny bit of brain power. Zombies and brains? That's the winning combo? Yeah. Sort of. In Dead Nation, the zombies can think a tiny bit. By default they will rush you, but they can be distracted. Shoot a car to trigger its car alarm and the zombies will be drawn to it — and will pound on it until it explodes and re-kills them. Toss a flare and zombies will swarm to that. These are not complex interactions, but they are small, key ways to effectively manage the river of undead the game pours at the player. They help, no pun intended, establish the game's flow. And this game is best played on HD TVs? Yes. Dead Nation's greatest strength and its biggest weakness is its graphics. The game looks amazing in the right light, presenting incredible spectacles of multi-layered ruined cityscapes populated with such well-drawn zombies that you can distinguish the armies of undead doctors from the undead firemen at a thousand feet. But the game is also dark — too dark. Borrowing from genre classics like Resident Evil, the game expects you to use your heroes' always-shining flashlight to spot the enemy, but even under moderate in-game streetlight it can be nearly impossible to see zombies who are already halfway to killing you. There were too many times when my hero was taking damage without me seeing a zombie touching me, even in supposedly illuminated areas. Be prepared to turn your gamma up on your TV and expect to miss a ton of detail if you don't play on an HDTV. All the nuanced zombie killing described above in this single video of me playing the game! The biggest problem with Dead Nation is its genre, which may be too tired for a lot of people. It's not like Dead Nation is a brand-new thing; it's just a very fun version of a familiar thing. Fans of Super Stardust HD might be puzzled by the game's unnecessary live-action intro and its minimal story. Ignore it. The shooting and rush for high scores in the fastest times is here, is pure and is quite fun. Dead Nation was developed by Housemarque and published by Sony Computer Entertainment for the PlayStation 3 (downloadable only), released on November 30. Retails for $14.99. A copy of the game was given to us by the publisher for reviewing purposes. Played through the game's 10 levels in one continuing — but checkpointed — campaign, customizing my loadout, then tried individual missions and off-line co-op. Helped America top the world.